Scrap Gold: What Is It and How to Calculate Value? 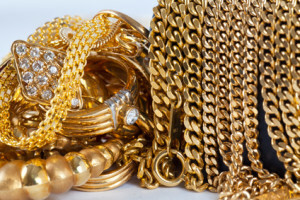 Scrap gold is a term that is often used, but some people are confused as to what it means. Let’s see what scrap gold is and how it is measured and valued. The term “scrap gold” refers to gold that is sent to a refiner to be melted down and recycled. Therefore, any item that contains gold and is meant to be reprocessed can be considered scrap gold. For example, if you sell your old jewelry to a gold dealer, who will send it to a refinery, the items you sell will be bought as scrap gold. When bought and sold, scrap gold is often weighed in troy ounces: 1 troy ounce is equal to 31.1 grams (1 gram = 0.032 troy ounces). Another common unit of measure for scrap gold is pennyweight (abbreviated as “dwt”). 1 pennyweight (1 dwt) is approximately equal to 1.555 grams, 0.05 troy ounces, or 0.055 ounces. Alternatively, 1 gram equals 0.64 pennyweights, 1 troy ounce equals 20 pennyweights, and 1 ounce is equal to 18.23 pennyweights. An important characteristic of scrap gold is its purity, which tells you what percentage of an item is made up of actual gold and how much of the piece is made of other metals. Purity is measured in karats, and the maximum gold content an item can have is 24 karats, which is the karat number of pure gold. To convert karats to a percentage, simply divide the karat number by 24. For example, a 14-karat (or 14K) ring contains 58.3% pure gold (14 divided by 24). Click here to browse a collection of gold jewelry. The value of scrap gold depends on two main factors: weight and purity. Therefore, if you know the price of gold per unit of weight and you also know the karat of a piece of gold jewelry, you can estimate its value as scrap gold. As an example, if you have an 18K piece that weighs 100 grams, then the actual gold content of the item is 75% (18K divided by 24), or in other words, you have 75 grams of pure gold. All you need to do is multiply 75 grams by the current market price of gold per gram, and the result will give you an estimate of how much the gold in your jewelry is worth. This doesn’t mean that you’d be able to get that price if were to sell. Most gold brokers will buy your old gold at a 20%-40% discount to the market price to cover their melting, refining, and other operating costs. You can check current gold market prices here and here. There are many scrap gold dealers that can buy your gold jewelry. However, keep in mind that none of them will pay you as much as your jewelry is worth at the store – scrap gold buyers care about the value of the metal in your items, not about the value of their design. If you estimate the value of your scrap gold based on current market prices, remember that a buyer will most likely pay you less than your estimate since dealers work to make a profit on reselling your gold. Keep in mind that different scrap gold buyers may offer different prices for your jewelry depending on what they will do with it and whom they will resell it to. This is why you should research various options and review a number of offers. But as a rule of thumb, most scrap gold buyers will buy your gold at 60% to 80% of the market price — the high end of the range is usually offered to people that have a lot of gold to sell. So, for example, if you have a 14K gold ring that weighs 10 g (excluding stones and non-gold clasps), you actually have 5.83 g pure gold (remember that 14K divided by 24K is 58.3%). If the market price per troy ounce is $1,200, this means that each gram of pure gold sells at $38.58 per gram (remember that 1 troy ounce = 31.1 g), so you have gold worth about $225 on the market (5.83 g x $38.58). However, since most scrap gold buyers will offer 60% to 80% of the market price, you’ll get between $23.15 and $30.86 per gram, which translates to $134.96 to $179.91 in total for your item (a price closer to the high end will likely only be offered if you have hundreds of grams to sell at once). So suppose a gold buyer says, “We offer $23 per dwt for 14K gold.” How do you figure out if you’re getting a good deal? First, this means that the price per gram is $14.79 ($23/1.555 g since 1 dwt = 1.555 g). However, since one gram of 14K gold only contains 0.583 grams of pure gold, the price per gram of pure gold is actually $25.37 ($14.79/0.583 g). Compare this with the market price of gold per gram. Let’s assume again that the current market price is still $1,200 per troy ounce (31.1 g), or $38.58 per gram. So at a purchase price of $25.37 per gram of scrap gold (pure), the gold buyer actually offers you about 65% of the market price. Is this a good deal? It fits in the usual offer range of 60% to 80% of the market price, so let’s just say this is an okay price. You’re unlikely to get more than 70% of the market price unless you sell at least couple of hundred grams of gold. But if you’re selling just a couple of small rings or a light necklace, most buyers’ offers will be in the 60%-70% range. You can always try to negotiate, and some buyers are indeed open to negotiations, but set your upper limit realistically — most gold dealers won’t pay more than 80%. Those that pay more are few and are usually large operations that often also own metal refineries. The exception to this rule is a buyer that doesn’t buy the gold jewelry for scrap but for its value as jewelry. Those buyers usually base their valuations on the design, brand, and age of the jewelry, so if you have designer items and antique pieces, you might be able to get a better price for them than if you sold them as scrap. Where to Shop for Jewelry? For the best selection of jewelry brands and designs, we recommend checking out Amazon Fashion. What Are the Best Colors to Wear with Your Gold Ring?